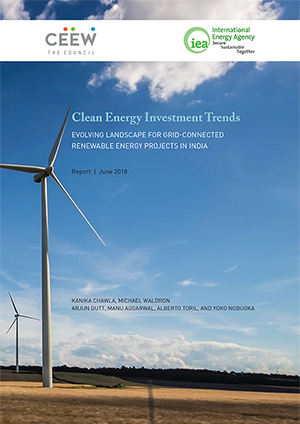 This study, the first in a series of trends reports being undertaken by CEEW in collaboration with the International Energy Agency (IEA), analyses project-level data for solar and wind energy over the 2014-2017 period, which is closely aligned with the recalibration of India’s RE ambitions and the revised target announcement of 175 GW of renewable energy by 2022. 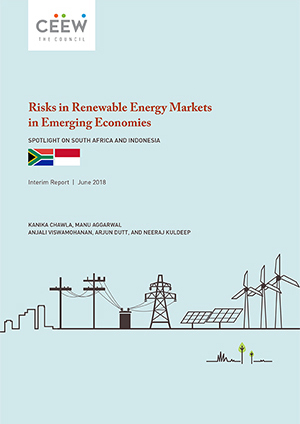 The analysis focused on the changing market landscape in the form of market concentration in investment decisions for solar and wind generating capacity, trends relating to the management of land acquisition and evacuation infrastructure risks and the role of solar parks, changes in average sanctioned solar and wind project sizes over time, and the evolution of offtakers for solar and wind projects from 2014 to 2017. In order to monitor and analyse the concerted action towards fulfilling India’s RE ambitions, this joint project with IEA will assess clean energy investment trends, with a focus on renewables and the power sector. 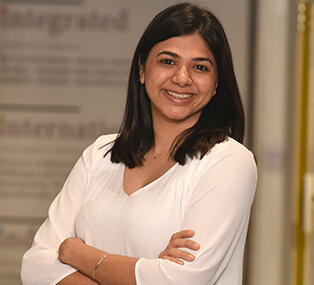 This project seeks to provide stakeholders a practical guide for understanding the current clean energy investment environment in India and how the evolution of regulations and risks are impacting where finance is flowing (and where it is not). There is evidence of greater market concentration among renewable developers, which is facilitating financing, but there may also be limits to higher levels of industry consolidation. The top 5 and top 10 players (in terms of share of projects sanctioned each year) have accounted for over 40% and over 60% respectively of the shares of sanctioned projects for both solar and wind generating capacity each year between 2014 and 2017. However, at least half of the companies among the top 10 (in terms of shares of projects sanctioned in a particular year) have changed every year, indicative of the limits of the capacity of even the top players to finance new projects. Solar parks are making India’s renewable development more accessible to investors around the world, but stakeholders face persistent challenges in scaling up this unique model. Solar parks have been successful in attracting investment flows, as well as the oversubscriptions of tenders that provide solar park allocations. However, the slow pace of sanctioning for new solar parks and delays in their development due to persistent challenges associated with land acquisition and the setting up of internal infrastructure have affected the pace of tendering of new solar park projects. Solar parks have yet to reach their potential - only 16% of the 40 GW target for solar park projects by the end of fiscal year (FY) 2019-20 have been awarded by the end of 2017. Ambitious targets and supportive policies have enabled bigger renewable project sizes. Average project sizes increased four-fold to 110 MW for solar projects and five-fold to 130 MW for wind projects over the period 2014-2017, as developers capitalised on economies of scale. The creditworthiness of offtakers, which affects the timeliness and reliability of payments for power purchase, is having a strong impact on renewable investment decisions. The timeliness and reliability of payments for power purchase by state distribution companies (DISCOMs) remains a persistent risk for investments. There is a rising share of sanctioned solar and wind investments that are based on a power purchase agreement with central government entities, compared with those executed with DISCOMs alone. In 2017, investment in renewable power, at nearly USD 20 billion, topped that for fossil fuel-based generating capacity for the first time.